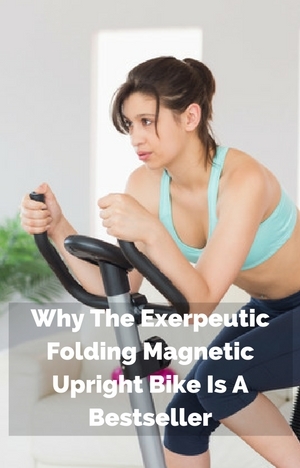 The Exerpeutic Folding Magnetic Upright Bike is the bestselling exercise bike week in week out. It must have something about it for to be continually selling well and also to be highly rated. 89% of customer reviews rate it a 4 or a 5. Even so at first look it’s reasonable to think if this bike is right for me or it is really up to it. Especially when you think of the price. But it seems it has enough about it to more than meet many people’s wants from a folding exercise bike. Here’s a quick description of the bike before getting into the reasons why it is such a best seller. This might not be the most affordably priced bike but it is close and you do get some good features for the price. Obviously it can be folded for storage when not in use. But it has more than that. There is a basic console with hand pulse sensors. This can help you to see your progress and help to keep you on track while you exercise plus monitor your heart rate using the hand pulse sensors in the handlebars. The seat height can be adjusted to fit a good range of different people to get an effective workout. It also caters for people up to a maximum weight of 300 lbs. Customers in their reviews say they like the bike on whole with them enjoying the space saving, quiet and smooth workouts and the quality for the price. You can read more about the bike in my full review here. Construction. It provides a stable platform for workouts even with it only weighing 39 lbs. It has a steel frame and stabilizer bars that provide the sturdiness so It doesn’t wobble around or make you feel like you might get tipped off. You can just get on with your exercise and workouts without any annoying distractions. It does need to be used on a level floor to stop any possible rocking due to an uneven floor. It can be put on a rubber exercise mat if that is an issue. Space Saver. The bike doesn’t take up too much room when being used. It just needs an area of 19 by 31 ins plus some space around it for safety. For saving space when you want to store it away, it is even better because it fold ups to an area of 19 by 19 ins, which depending on your vehicle means you can take it with you to work for getting some exercise during work on your vacation. It can be stored out of the way in a closet or behind a door. Your home’s living areas aren’t taken over by the piece of equipment . It doesn’t take much to fold it up – with it just requiring a removal of the holding pin and sliding the legs together and replacing the holding pin. It is then ready for storing. It has transport rollers that you tip the bike on to help you move the bike to and from storage. Wide Range Of Users. it caters for a range of people between the heights of 5ft 3 ins and 6ft 1 ins. With a max user weight of 300 lbs it is better than most bikes in its price range as well as a number that are more expensive. This means it can be used by more than one person – the speed of the adjustment won’t get in the way. It is easy to do using an adjustment knob and preset holes it can all be done in a few seconds so won’t get in the way of a workout. Ease Of Use. It’s easy and quick to set up with it just requiring the removing of a pin and sliding the legs out and re-insert the pin. After that you can just get on the bike and start pedaling, the computer comes on and you can see your progress as you exercise. The magnetic resistance is manually adjusted using the tension knob on the front frame support. It starts off easy and gets harder – you can see the level you set it at. Turning and reaching the knob is straightforward and easy to do. It operates very quietly with the loudest noise being any heavy breathing from the exertion. You can hear the TV easily over the bike without having to turning up the volume. It won’t disturb others when you exercise and you may even be able to exercise while others sleep without waking them unless they are very light sleepers. Your legs are going to out in front and down – not directly underneath you as it is on an upright bike or out in front like on a recumbent bike. Some may find it a little uncomfortable but most find it is comfortable and low impact. The bike is for beginners and those wanting a moderate level of exercise. It won’t satisfy people who want very tough hill climb workouts and very challenging ones – the resistance just doesn’t go up far enough for that type of workout. it’s also not designed for standing up on the pedals – as well as being awkward it will reduce the longevity of the bike. Getting on the bike may be difficult if you are shorter or have difficulty with lifting your leg up high with the x-frame giving it a high step over. People who do find it an issue have used a small step to help. But, these are all things to be expected with folding exercise bikes. The bike provides good value for those looking to get started or wanting to add more exercise in their life. It’s not for those wanting to do serious workouts or training for an Ironman. It can easily fit in most homes whatever size they are. It’s quiet and easy to use. You can just get on it and workout without disturbing others. It’s best for adding more exercise into your life and you don’t have to make major changes to your life or home get it done. Not quiet. Ver noise. No help from manufacturers, retailers nobody. Very very noisy. Can’t use it can’t return. Will donate to Salvation Army. Sorry to hear you had a bad experience with your bike. Did the manufacturer and retailer say why they wouldn’t help?